Did you know that some of the oldest houses have tile roofing systems? In fact, this material was first used by ancient Greeks and Chinese thousands of years ago. Until today, it remains a popular option because of its various benefits. 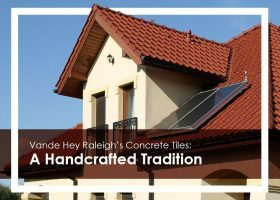 At Rogers Roofing, we install prestigious concrete tiles from Vande Hey Raleigh. Let us discuss what makes them a timeless roofing choice.